The Translation industry is continuously evolving: tools we used two or three years ago are out of date already. With the ever-growing volume of work that language service providers are handling, there is huge pressure on firms to increase productivity while cutting production costs. 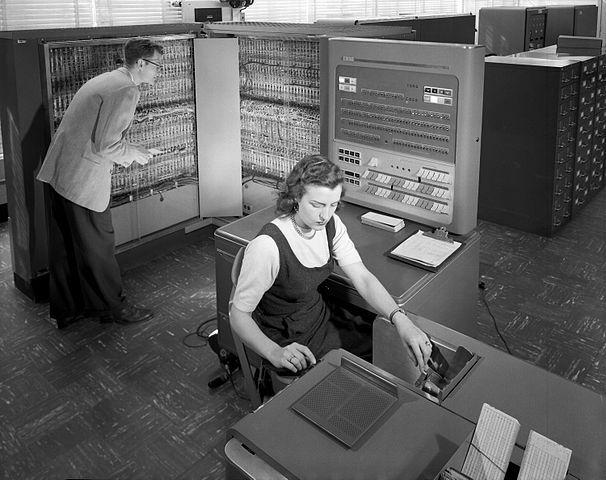 As time and cost are crucial factors, in many cases Machine Translation (MT) may save the day. However, tempting as this may seem, as things stand, the technology is still not yet tailored to meet every translation need. 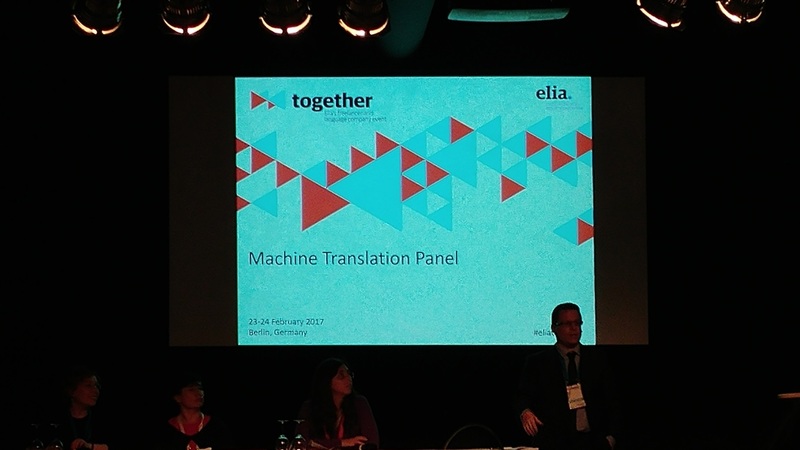 I had the great pleasure to attend EliaTogether conference in Berlin – an initiative by the language service providers association Elia intending to bringing together providers and freelance translators for constructive dialogue and growth. This year’s focus was on Communicating for Success. The conference featured three tracks – Relationships, Processes and Technology aimed at meeting the diverse needs of both language professionals and language service providers. During the event, I attended an extremely interesting MT panel which introduced the attendees to the world of MT. Led by Dimitra Kalantzi, the panellists Ana Guerberof and Svetlana Svetova and delegates who joined in the discussion stressed the need for awareness both of the value MT adds to the business and its limitations, in order to make the most of this revolutionary translation method. MT (Machine Translation) is fully-automated translation using software, which theoretically requires no human involvement. As with every machine, at the heart of MT is an engine which learns from you as you translate. For this engine to produce high-quality output, you need to train it first = feed it with bilingual pairs (source and target) of previously-translated texts, which are then analysed by an algorithm to produce a translation of the highest probability. MT output can at a later stage be either subject to light or full human post-editing to provide high-quality result. Is using MT a breach of confidentiality? There are generally two main types of translation engines available – public (like Google Translate, which uses publically-available web content); and private (a wide range of tools are available such as Kantan MT which you can train yourself and no one else has access to). In the case of sensitive projects, it is essential to carefully consider when MT is used as you might be sharing the content with a third party if you are using publically available free software, which would lead to breach of confidentiality. Very few people actually read the conditions of use before consenting to the re-use of their phraseology and to the texts being stored and perhaps subject to monitoring by government agencies. Hence, while the Google Translates of this world are useful for translating the odd word or phrase, it is not advisable to load up your new product description or documents laden with company names and trade terms. Is MT to replace language professionals? How is human translation better? As complex as human language is, the art of translation is not only about transferring words from one language into another. No engine is able to analyse the context the way a language professional is capable of doing, coping with the language barrier by adopting native phrasing of sentences and the specific style of a particular language. Therefore, instead of competing with MT, a skilled translator can cooperate with it, combining instant MT output with his expertise to provide high quality result. MT post-editing on the other hand can boost the translator’s productivity significantly. MT works well only with clear, well-written and repetitive source text, such as a wide range of user/technical manuals and informative websites. Legal documents prove a challenge to read as only properly-educated translators have the skills and experience necessary to understand the nuance of such texts. MT so far is poor in this regard, lacking this ability, translating documents with strict literal meanings, without the creativity essential for producing marketing translations which sound stylish and catchy. To sum-up, MT can be a huge asset to our sector once we fully realize its pros and cons, both as language service providers and translation buyers. MT cannot be entrusted when an official translation of superior quality is needed as even the best-trained MT produces only a working draft which should then be subject to further correction for exactness and correctness. If you decide MT is the right solution for your project, you need to make sure the expertise of a human translator is used for reviewing, editing and proofreading MT output so as not to jeopardize your business’ reputation. 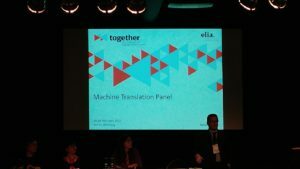 Uncategorized #eliatogether, Ana Guerberof, Dimitra Kalantzi, Lacrosse, language service provider, Machine Translation Panel, Svetlana Svetova. permalink.